Cultural drawcards – lessons for Alice from MONA? The museum from across the Derwent. Courtesy MONA. The Museum of Old and New Art (MONA) in Hobart has become the second-most visited attraction in Tasmania, after the capital’s Salamanca Markets but out-competing the state’s glorious national parks. There may be a lesson here for Alice in thinking about the development of an Aboriginal cultural centre of national standing. 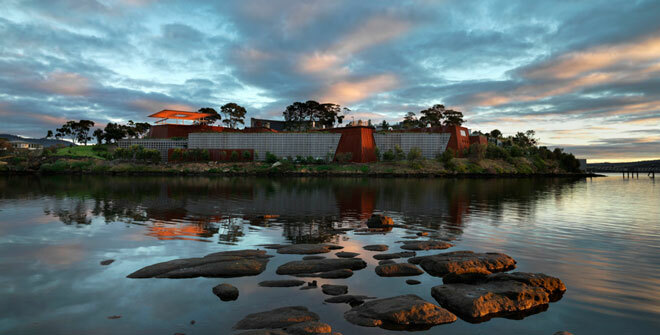 Tourism Tasmania’s visitor survey for the year ending June 2015 reported over one million visitors to the state, of whom one third (more than 300,000) visited MONA. These visitors spent an average of 10 nights on their Tasmanian holiday, and over $700 million dollars. Five percent of them said that the visit to MONA had influenced their decision to visit Tasmania. The cultural and economic impact of the unique museum, established by David Walsh who made his fortune from gambling, is widely acknowledged. Interestingly, before it even opened its doors, it began building its profile with the MONA Festival of Music and Art – MOFO for short, a deliberately bold acronym for an event that sets out to break ground. MOFO by day. Photo by Joshua Santospirito. 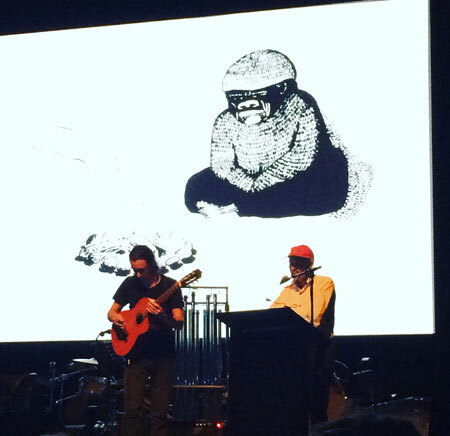 This year’s MOFO has just concluded and included in its eclectic line-up was Alice Springs author CRAIG SAN ROQUE, in a performance drawn from the graphic novel, The Long Weekend in Alice Springs, winner of 2014’s Chief Minister’s NT Literary Award. At MOFO San Roque provided live narration to an animation created by JOSHUA SANTOSPIRITO, who was also on stage on guitar. The museum is a subterranean architectural marvel, cut deep into sandstone and banked along the Derwent River edge like an old Sumerian palace, a ziggurat with water views. Composed around an old Italian vineyard bought by David Walsh and sustained with millions from his own deep eccentric pocket, MONA is a kind of dream come true, sustaining culture and economy; and long may it live. Or maybe move to Alice Springs? The January festival gathered specially selected artists from all around the world, putting them together into unique and gracious combinations. The lineup included the brash and bizarre Flaming Lips rock group from the USA, the elegant and comical HERMES ensemble from Belgium, Norway’s ‘Apocalypse Girl’, Jenny Hval, Tony Buck, drummer from The Necks, three masterful Beckett Plays from Adelaide, Kate Miller-Heidke and the Tasmanian Symphony Orchestra, Evelyn Glennie, miraculous Scottish percussionist, Hailu Mergia, the Ethiopian jazz musician – a whole range of over 200 edgy performers and somewhere in this Josh and I found a place, thanks to Brian Ritchie’s far reaching curatorial imagination. MONA helped us stay afloat for a week, performing The Long Weekend In Alice Springs as the opener to the Hitchcock silent film, The Lodger, at the Hobart Odeon and then integrated into the MONA cinema along with Stephen Page’s Indigenous dance film, Spear. With him playing guitar and me narrating in measured tomes, it was seen by 900 people over the week, drawing many comments of appreciation. Many people were moved, even speechless after this glimpse into the inner life of Alice, so carefully told. One very elegant man described its austere and challenging story as nonetheless “gentle and insightful”. Janet Holmes a Court was among the graciously enthusiastic and bought a signed copy. By the way, the graphic novel is now into its third reprint, having sold over 1,500 copies – something of a miracle in Australian self-publishing. Copies are available locally through our wonderfully surviving bookshop, Red Kangaroo in Todd Mall. 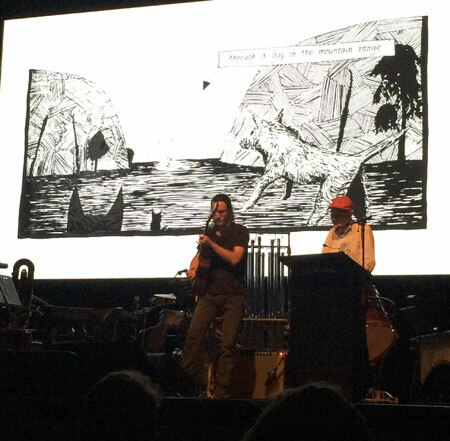 Josh has since created another comic, Swallows, which was launched at the Alice Springs writers festival in 2015. It tells the story of the Santospirito family as they migrate from Italy to Carlton in Melbourne. And now he and I are collaborating on another, Sydney/Purgatorio, a dreamlike murder mystery, a many-layered history set in Woolloomoolloo and Kings Cross and modelled on Dante’s Purgatory. Josh reckons it will take years to complete. Below: Josh (left) and Craig during a performance. Photo by Alvyn Williams. Craig san Roque: Yes the life extension offered by dialysis is valuable but the frustrating part is that all the medical treatment in the world merely prolongs sickness. Prevention involves diet, exercise and for some less alcohol although I have many stricken friends who never drink. Knowledge of the progress of diabetes from metabolic disease is not adequate in our medical profession. Low blood sugar in an obese patient is usually seen by doctors as good, the pancreas is working well when actually it’s over reacting and the person has hypoglycaemia, just a step away from diabetes. That’s the intervention point, not when the blood sugar is soaring. Perhaps doctors have given up, compliance with diabetic mediation and monitoring is very low and ensures that dialysis is needed quite soon. Although not publicised, dialysis protocols have been changed with patients removed from treatment lists as they enter the final stages of the disease. No more dialysis up to the point of death, the system is in melt down through burgeoning demand. It’s a painful death, end stage patients suffer terrible headaches, many are content to die to spare themselves more torture. Quite a few head back to their communities to die without treatment. The scale of this tragedy is immense. Absolutely agree that there is some great potential to learn and apply ideas from the MONA experience, as regards a new tourism experience for Alice Springs and the broader region. Jamie: Thank you for adding such detail, and I agree that this diabetic hunger is far worse a situation than the general matter of food supply and availability than I was suggesting. Perhaps it is the kind of account that Alice Springs News Online could develop with your assistance and that of the Purple House and Sarah Brown. This takes me back to the article in the AS News on the death of Andrew Spencer Japaljarri. He too, despite all his self care, went under to the diabetic condition in the way you describe. @ Craig san Roque: Yes, hunger is a worry but for reasons that are far worse than you suggest. Contemporary Aboriginal hunger mainly arises from metabolic disease. The more obese the person the more they suffer constant hunger. This is just before full blown diabetes strikes. Then high levels of sugar will ravage every organ in their bodies, amputations are common as infections cannot be easily controlled. Many of the skinny Aboriginal people you see are not healthier, they have got full blown uncontrolled diabetes, with no insulin they don’t store fat. In this group most will be end stage dialysis patients within a couple of years. Most will be dead within five years. Deaths in the age group 30 – 40 years are common, few live longer than 50. Constant hunger is all too often the first symptom of tragic medical conditions. 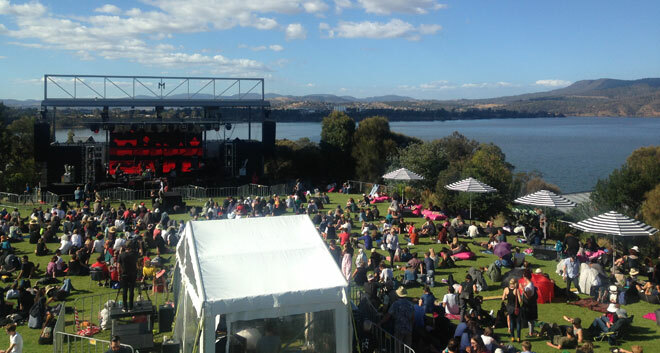 During the MONA FOMA performances I was asked once or twice what the whole Long Weekend Story is about. Well, I said, its about many things, including the impact of sites on people and the effect of our history, but a theme running all through is that of food, food security, hunger. This is why it begins with the old woman at the cooking fire, we go hunting for lizards, I give the man with the dog a sandwich and the character Amos refers to psychological cannibalism and being consumed by powers bigger than ourselves. The story ends with an empty fridge. A big worry in Central Australian Aboriginal life turns around being hungry, getting access to good food without having to give it all away, the cost of vegetables in community stores, the prevalence of sugars in all forms, hunting money as a way of getting fed … etc … There is a way of thinking that goes with hunting and gathering. Hunger is a worry. Alice Springs News Online readers who are interested in such themes might like two perceptive books reviewed in the New Statesman by John Gray 13/11/2015. These are The Reproach of Hunger; Food Justice and Money in the 21st Century by David Rieff (Verso) and Eating People is Wrong and Other Essays on Famine, its Past and Future by Cormac O Grada (Princeton). I wonder how locally experienced people would analyse our own situation, taking notice also of Cormac’s list. It would be useful to hear how the bush stores are going. Sounds exciting. I can’t wait to see your vision of Purgatory, Josh.